Does this count? 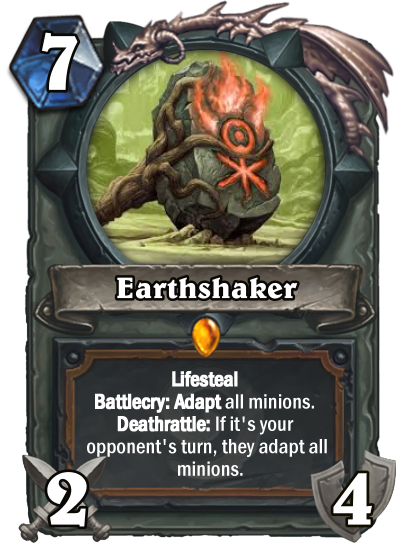 It's combination of Tar Elementals, Lifeasteal and Golems. Reposting, because I want to know if it's allowed. 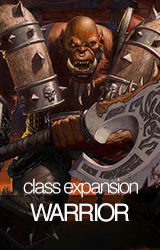 I don't believe it does, it needed at least 1 keyword mechanic from each of the mammoth year expansions. 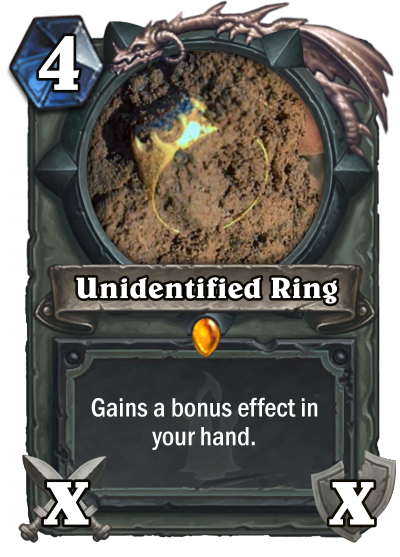 It has the lifesteal from Frozen Throne but needs something from Un'Goro and Kobolds. Yes, we can include the Tar and Golem mechanics in the prompt. Scrapped the initial idea, legendary weapons feel like the least clunkiest to work with. 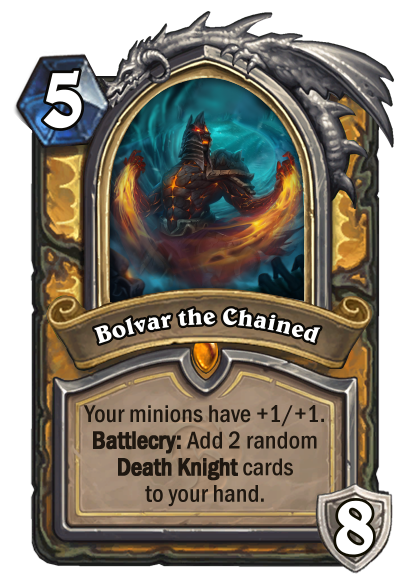 With this I wanted a battle for board in which if you don't have the upperhand it can be detrimental to play it or if your opponent gets control then they can remove your weapon to benefit themselves. 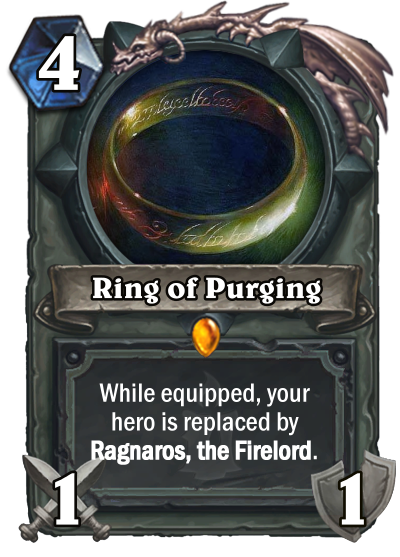 High durability to not allow the druid to immediately remove the effect. 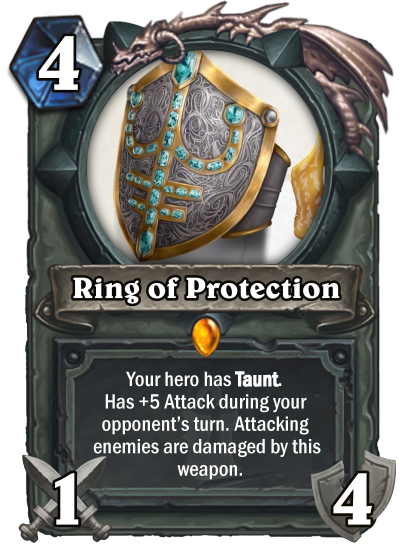 Also prevents druid from popping this off in case opponent has a sizeable board as well and effects what you would choose on the adapt. Thought of something a little bit easier and more interesting to work with. 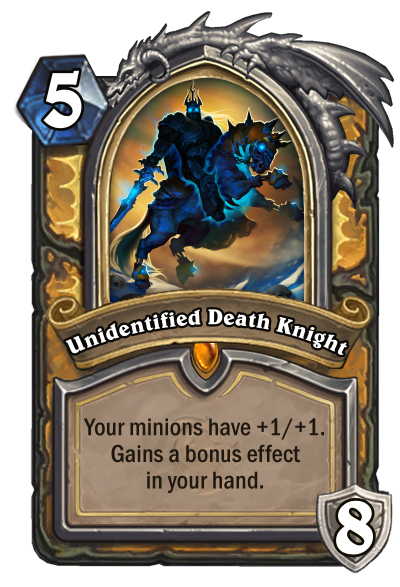 Incidentally also a Paladin Legendary. 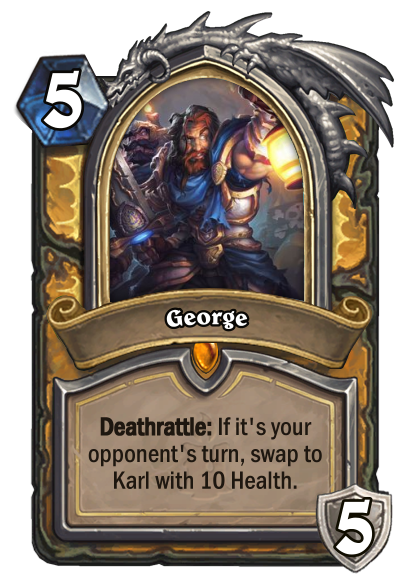 While you are George, your Hero Power is Rush to Aid, then it's replaced by Silver Hand Justice when you swap to Karl. Sinthuja: I like the general idea. 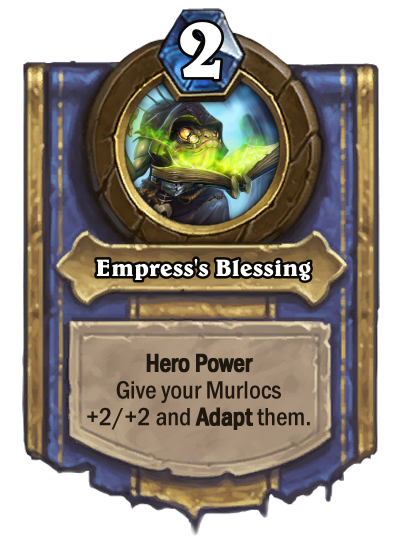 I'm still not sure if we should use 3 mechanics, one per each expansion, or less. If less, then i would remove Lifesteal keyword, to make text box a little more clear. If you like lifesteal keyword, ii would rename card to something like King's Blood Drinker. Kovachut: I like your concept. 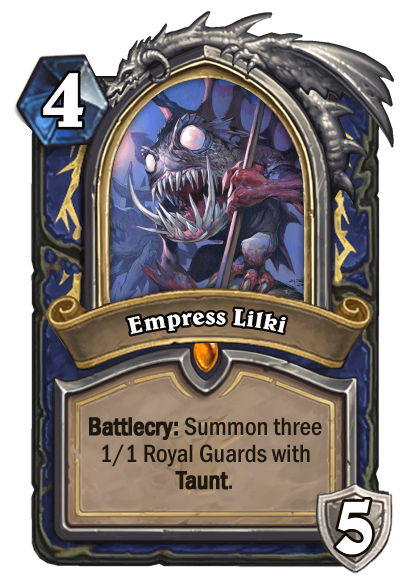 I would give increasing mana cost for each form of Lilki - 4 for princess, 6 for queen and 8 for empress. 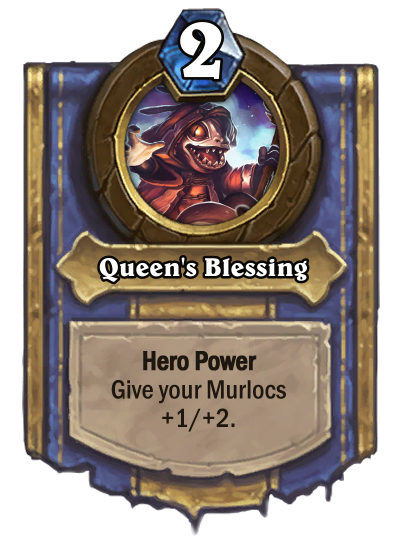 The fact that murloc quest exists make your card very powerful. 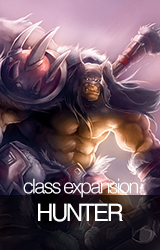 I would keep your initial hero powers scaling - it is more clear thn your updte proposal. OttawaCloset: I like the general idea. 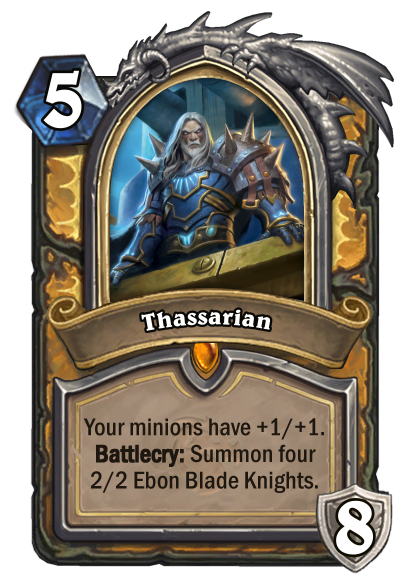 I'm still not sure if we should use 3 mechanics, one per each expansion, or less. 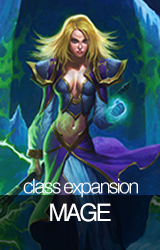 If less, then i would remove Lifesteal keyword, to make text box 4 lines. 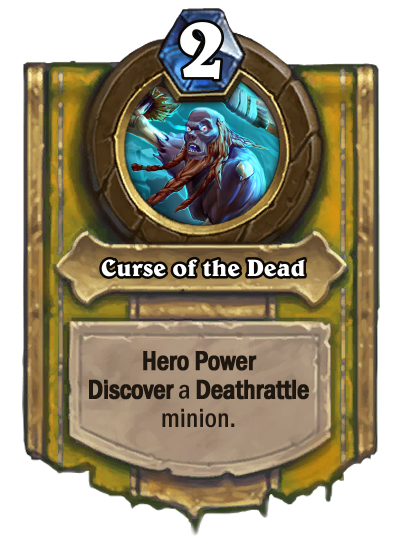 I would rewrote deathrattle to : If it's your opponent turn, he Adapts all minions. DemonXz: Finally, not overpowered and intresting Hero Card. Nothing more to say. 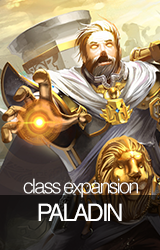 Yes, we need to use at least one mechanic per expansion. Feedback time! I wasn't able to do this before, I hope it's not too late. Also Tar ('Has X during your opponent's turn.') 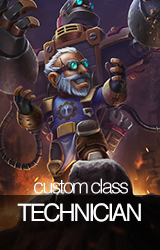 for JTU if we're talking missing mechanics. 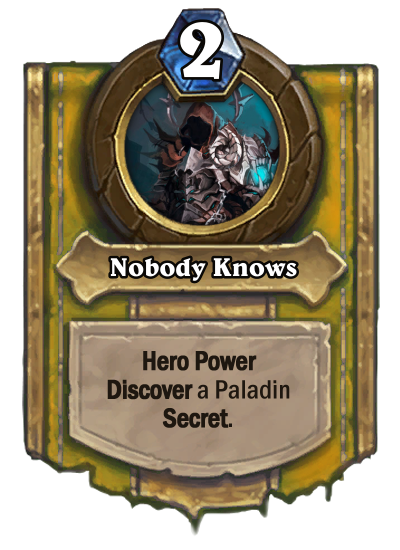 Not sure if Rogue Secrets will count, though; never got any past K&C, right? 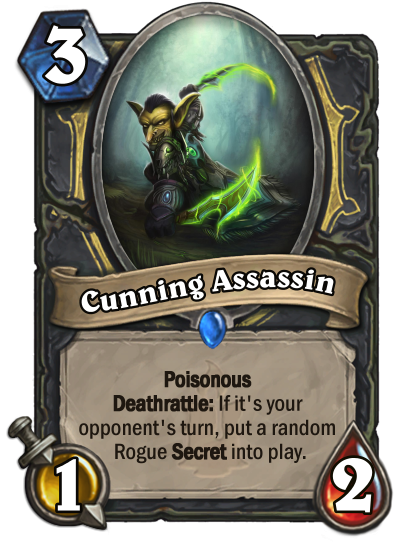 I'd say Rogue Secrets are not a mechanic per se. It's a pitty, because it was a nice card. Volatile Sludge: Taunt, Deathrattle: If it's your opponent's turn, deal 1 damage to all enemies. Carnivorous Sludge: Battlecry: Deal 2 damage to a minion. If that kills it, Adapt. 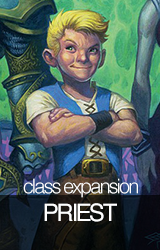 Does this fill the criteria however, given the base card itself does not? Yes, it fits the criteria. 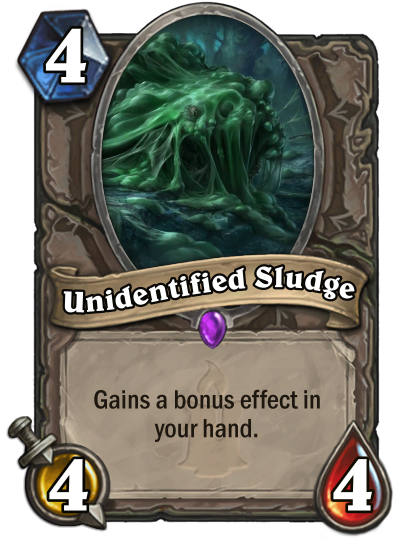 However, Unidentified cards always have 4 options, so you should probably come up with another type of sludge. Wow, that's a lot of tokens! I personally dislike the incredibly high complexity of the card, but some people might enjoy how it overkills the requirement of this week. That said, I'd give a different name to each version of the Hero card. 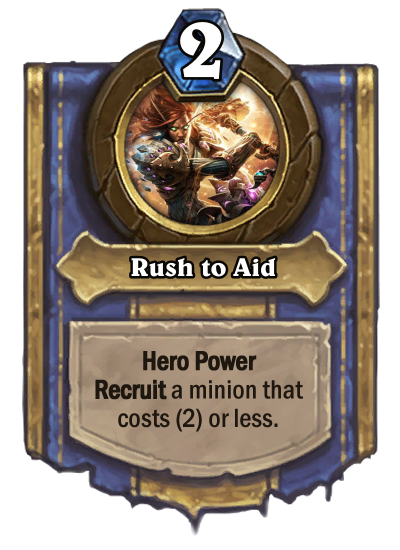 I get it's a combo disruptor, but you're paying six mana for an effect that will benefit your opponent most of the time. Thanks for your feedback! I didn't use your suggestion, but I came up with another way to make the Lifesteal version more worth it. 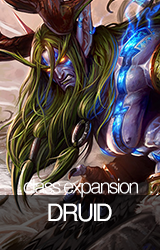 I like Shadow Word: Mutation, but call it Shadow Mutation instead. 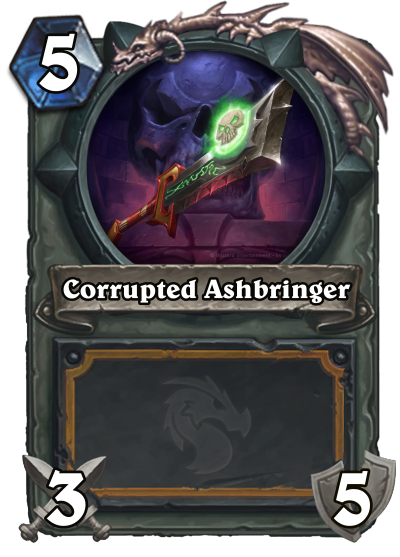 All Shadow Words so far are removal that depends on Attack, which your card isn't. 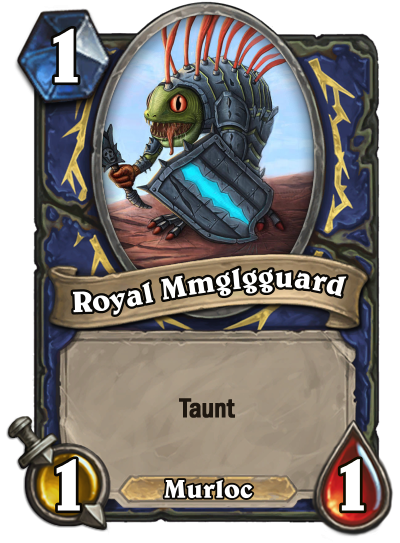 1) 6 mana, Battlecry: Summon 1 1/1 Taunt & Adapt your Murlocs. 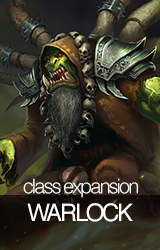 HP: Give your Murlocs +1/+1. 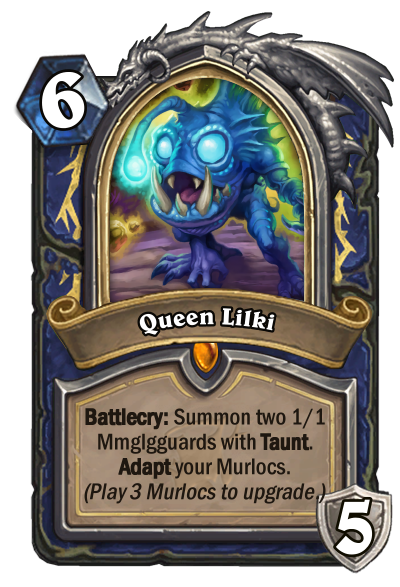 2) 6 mana, Battlecry: Summon 2 1/1 Taunts & Adapt your Murlocs. HP: Give your Murlocs +1/+2. 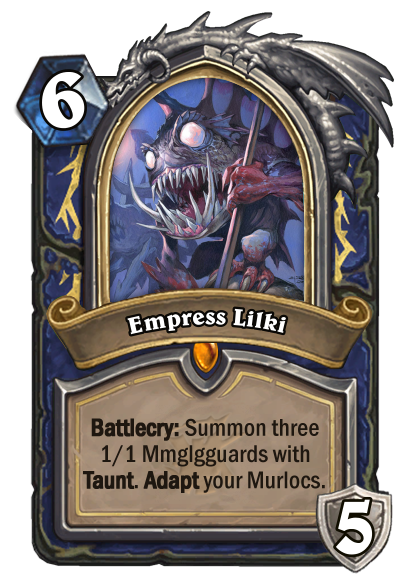 3) 6 mana, Battlecry: Summon 3 1/1 Taunts & Adapt your Murlocs. 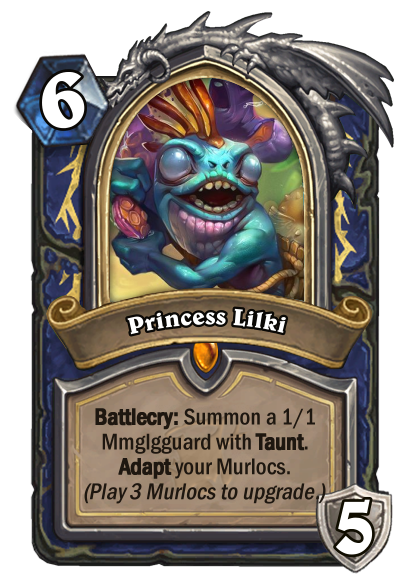 HP: Give your Murlocs +2/+2. 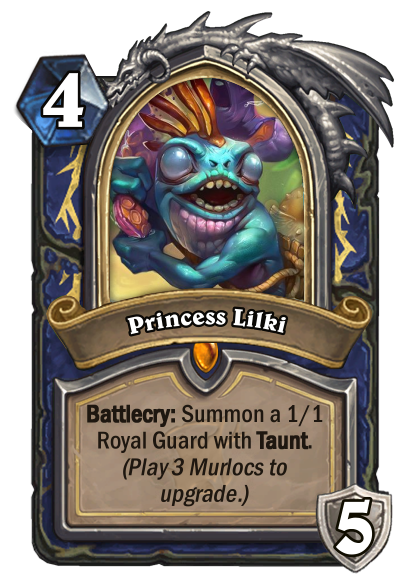 It's pretty cool, but the Princess' Battlecry feels a bit too underwhelming. 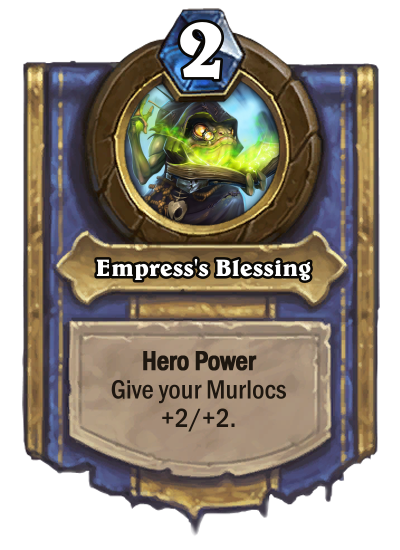 I guess it's okay, because the Empress' Hero Power is really strong. Your card is really good! 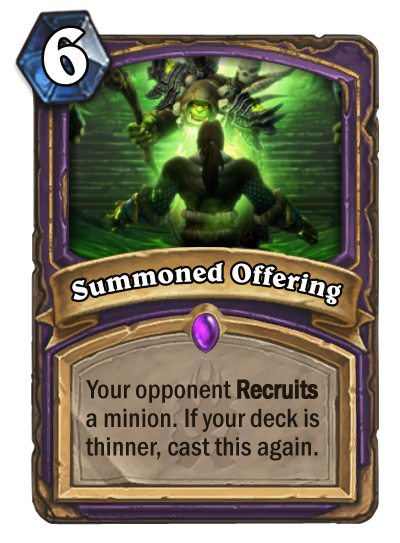 Combining Hero cards with "Deathrattle: If it's your opponent's turn..." is quite clever and could lead to very interesting gameplay decisions. 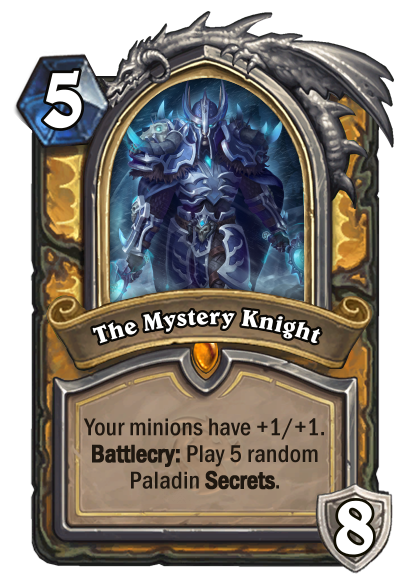 My only problem with the card is that it's a 5 mana do nothing. 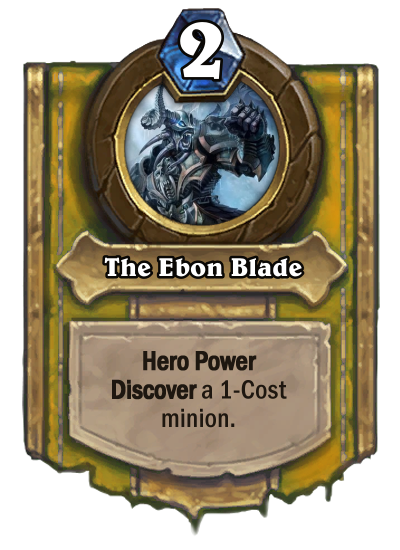 However, reducing the Mana cost would be too dangerous because the Hero Power is nuts. I just noticed by offering my card that my idea is very similar to those of other participants. I just didn't look at other proposals to prevent this from happening. Edit : Ok, I read all the previous posts and I do not participate in the competition, given the similarities with the ideas of ArngrimUndying. No problem for me but I do not want to be accused of plagiarism. 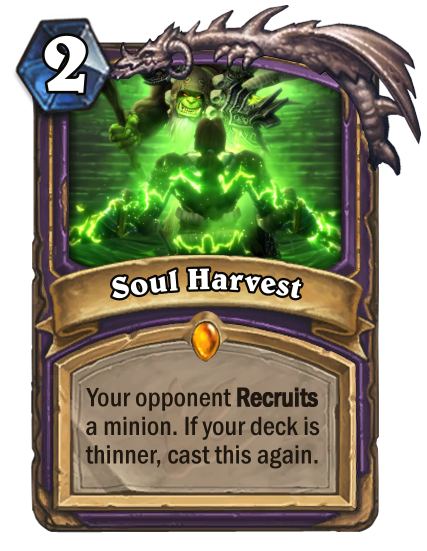 Summon minion for your opponent means summon anything on his board during your turn, opponents deathrattles also count. I like your balance and all effects. 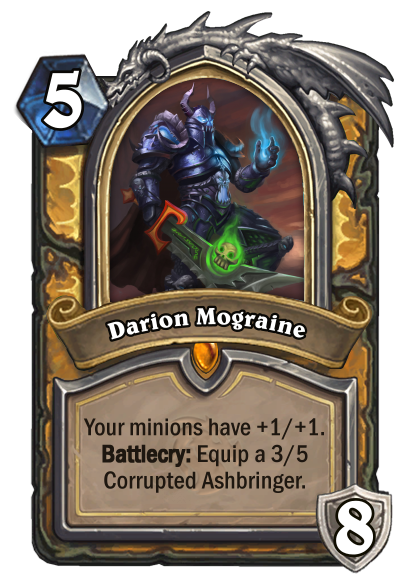 The only request I have is to change Chaotic-Good alignment to Chaotic-Neutral - dealing damage to all minions without giving them health seems as not good deed for me. Not sure why moderator said it's not using Golem mechanic correctly. 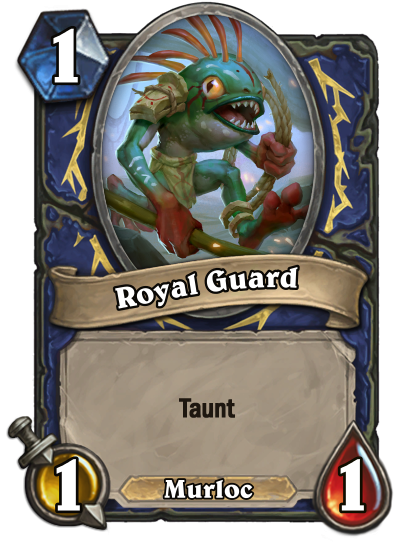 Maybe change wording to: Taunt. 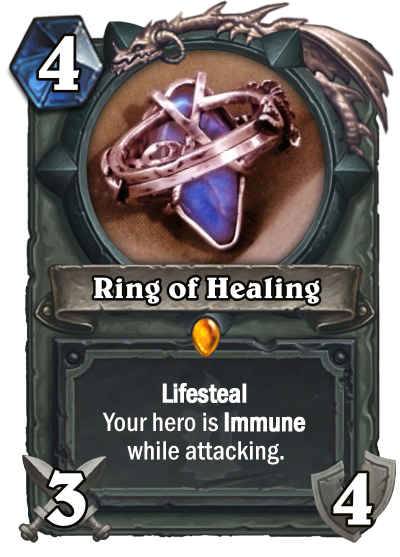 Has Lifesteal if you have 5 or more armor. Has +6 attack during your opponent's turn. 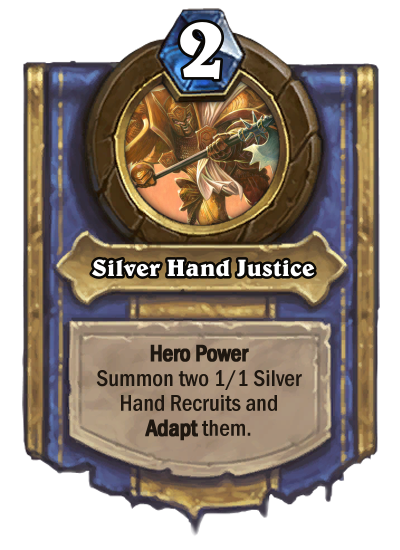 I was about to return the feedback after doing more tavern brawl games, but since you redesigned your card, I might as well comment on it now. I'm sorry to say this, but I don't like it at all. 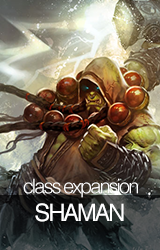 The first version was both weak and powerful, as it served no other purpose than to interact with your opponent's deck. 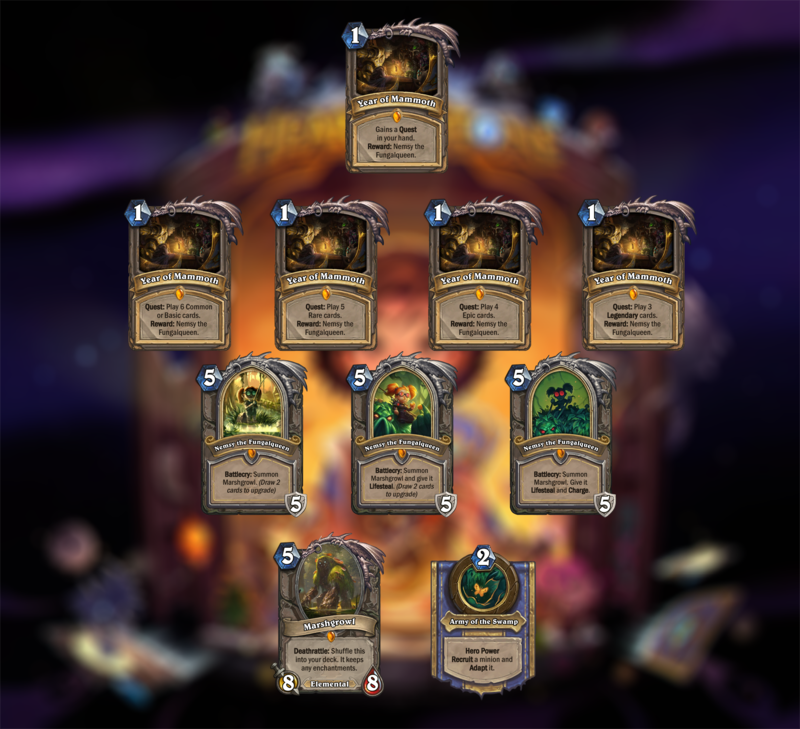 Playing this against aggro or mid-range decks would have only resulted in helping out your opponents + you would spend 6 mana doing so and thus it would immediately become a dead card; against control this can bring the enemy closer to fatigue (though this can also recruit something big, which you might not be able to answer immediately) and against combo this might pull a combo piece sometimes. Imho the design is just too frustrating for both players. 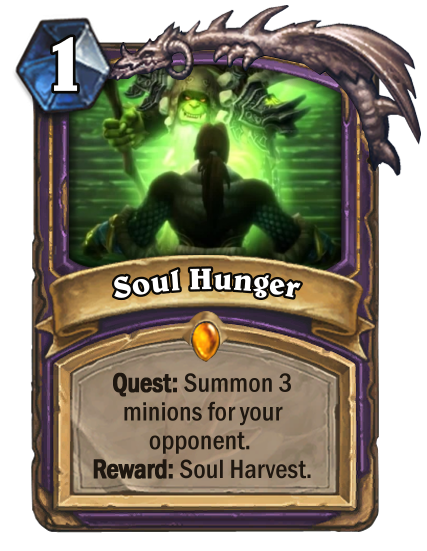 The second version leans more on the bad side, as you need to complete a quest, in order to get the reward. 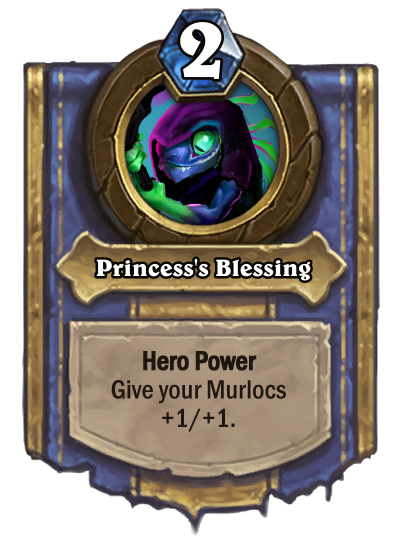 The spell costs only 2 mana, but if you ask me, I would never include such a card in my deck. It's too situational and not really worth it. Sorry, mate. 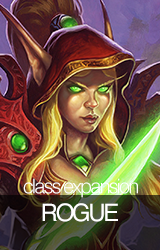 Inb4 recruit came out with the release of K&C, so don't use watermarks for expansions prior to that one. 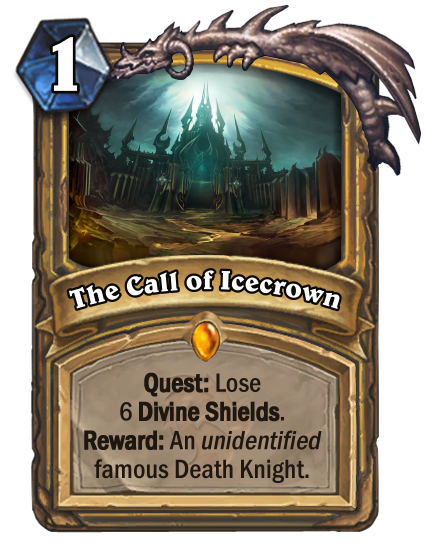 In the vein of Light's Sorrow and Bolvar, Fireblood , The Call of Icecrown pushes Divine Shield paladin to the limits! 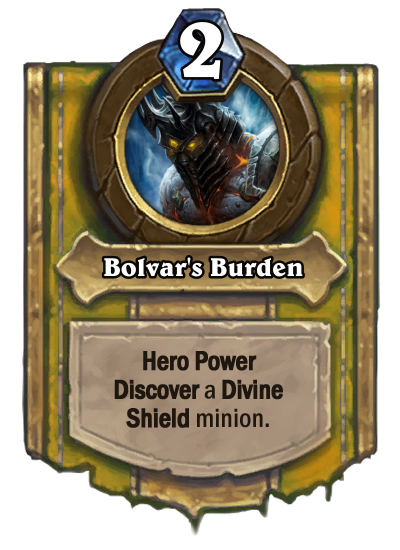 Bolvar gets sidelined by all the other cool Paladins and Death Knights. He's burning with jealousy. 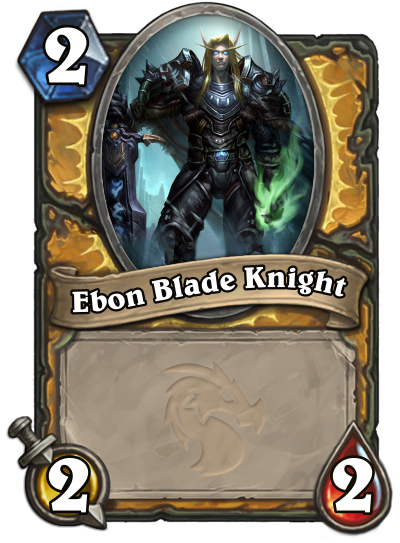 The Ebon Blade is short on horses for now. Face the power of my Lichmas Tree! To be honest, I'm not surprised by what linkblade said. Both Golems normaly can only Attack when you have X or more Armor. My card has different effect, even if the activator is the same. I had hope that it counts, but as I said I was prepared for that. To your card, I must agree with what Kovachut said. It needs from you to build a deck around it, and it have sense to play only against some specific decks. To be honest, you should just leave this idea, and try to come with another one. Thx for the feedback; I'll go fix my card. 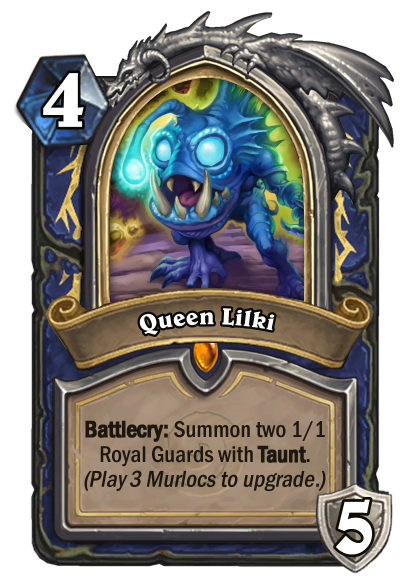 If I have to be honest with you, I also considered increasing the cost of the 3 different Lilkis, but then I thought some people wouldn't approve this seeing how the spellstones don't undergo a cost change, whenever they get upgraded. Hi all, just looking for some feedback on my submission. 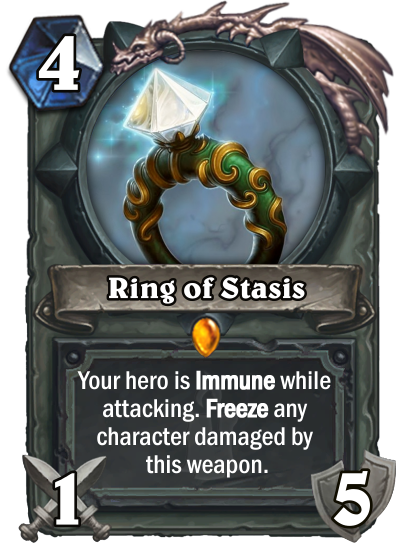 What does everyone think about a neutral legendary "weapon" (ring, really) as a concept?